It seems the U.S. Postal Service is getting into the appeasement act. They will issue a new stamp celebrating the Muslim holiday of EID as part of their â€˜Holidayâ€™ Celebration Series. Greetings! And Happy Holidays from Allah to you. 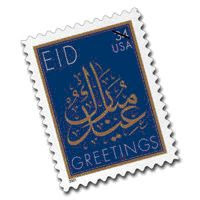 The Holiday they are celebrating with this Muslim stamp is EID. And what is EID? Iâ€™ll let my eloquent co-host, Always on Watch, speak to that. The Battle of Badr of March 17, 624, is one of the few military conflicts specifically mentioned in the Qur’an and holds a great deal of significance in Islam. Eid ul-Fitr, the final portion of Ramadan and which the lighting of the Empire State Building will recognize this weekend, has as its origin the aforementioned battle. Furthermore and most importantly, this battle marked the turning point for Islam, both politically and ideologically. In other words, victory at the Battle of Badr proved to Muhammad and his adherents that Islam should from that time forth take on a militant aspect because such is the will of Allah. Is this what the Christmas Season has degenerated to? No user commented in " Storm Track Appeasement: U.S. Postage Stamp Celebrating Muslim Victory to be Issued "